You have just a few more hours to enter to win an ebook copy of Gunpowder Alchemy and also one of Laura Florand’s ebooks in celebration of our trip to Momofuku Milk Bar over RWA! Click over to this post and scroll down for the giveaway. Gunpowder Alchemy by Jeannie Lin is set in an alternate, steampunked (or more accurately, gunpowdered) Imperial China. It tells the story of Jin Soling, the daughter of a disgraced imperial scientist. Her family has fallen on hard times since the death of her father. Her mother is an opium addict and her brother keeps getting into trouble in school while she works for an apothecary/acupuncturist. They are barely managing to keep themselves alive via Soling’s earnings and selling off old family treasures. But when Soling tries to sell a relic of her father’s former career as a scientist for the emperor, she is arrested and brought to the Crown Prince, who sends her to work with Chang-wei, her father’s former protege and her former betrothed. Over the course of their work together, they run into Yang, another man from Soling’s past. The plot revolves around Soling, her duty to her family, her duty to her country and emperor, and what she wants for herself. This is a passionate book full of adventure, intrigue, domestic plots, foreign interference and a bit of a potential love triangle. The historical backdrop is that of the Opium Wars, the conflict between Great Britain and China over the disposition of trade in the region. While the story provides plenty of insight into the domestic and international conflicts, it left me ruing my ignorance of Chinese history because I don’t know much other than that, well, China pretty much lost, setting the stage for 100 years of exploitation by the West. It will be interesting to see how the conflict plays out in this alternate history where Chinese mastery of gunpowder technology seems poised to make a difference. As for the romance, the second chance at romance isn’t my favorite trope, but Lin makes it shine. Rather than the typical formulation where the ugly duckling heroine has transformed into a swan, Soling and her family has sunk to the bottom of the barrel of Chinese society. In Gunpowder Alchemy we get to see the beginning of her transformation again into the person she will eventually be. It really parallels her relationship with Chang-wei as both of them struggle with loyalty to themselves, their families, their country and each other. Strict HEA purists may want to wait for the projected second and third books before starting this series, but I was glad I didn’t wait. After reading Gunpowder Alchemy I went and bought not only all of Lin’s historical category romances, but also her erotica series written under the pen name Liliana Lee. The second book of this series, Clockwork Samurai, should be out December 1st of this year. I’m really looking forward to what lies in store for Soling and Chang-wei. 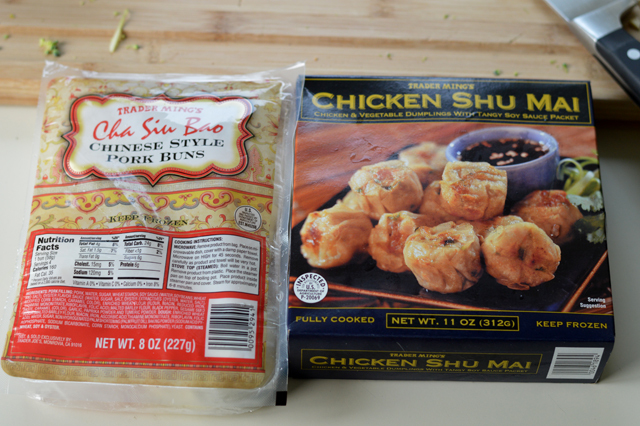 Growing up, I’m not sure I ever ate a single vegetable that wasn’t steamed. I’m not sure I knew you could cook vegetables any other way. This was the height of the anti-fat 1980s so the idea of adding oil to a vegetable was probably anathema. Steaming is also quick, easy and BORING AS HELL. The only good thing I can say about it is that it’s not boiling. Because seriously? Who boils a vegetable any more? The first time I went looking for a different way to make asparagus (which, honestly, my mother did used to boil), I discovered a Joy of Cooking recipe that used just a bit of olive oil, a little salt & pepper and 450 degrees of heat for 8 minutes. That’s it! So fast! So much better tasting than steamed! All those crispy bits! I can’t say it was life-changing, but it was definitely vegetable-changing. Roasting is where it’s at. There’s, um, no roasted broccoli in this book. 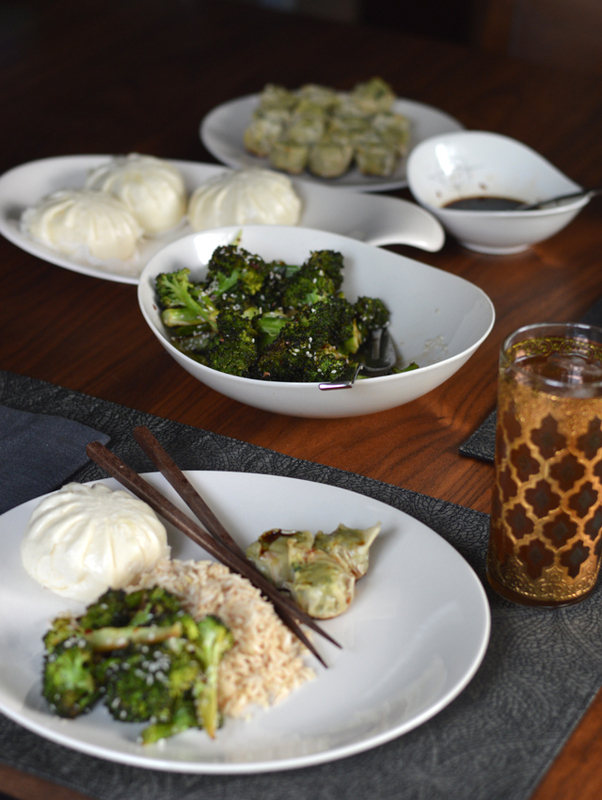 And if I were truly on the ball, this would be Chinese broccoli and not plain, regular broccoli. But I try to buy my produce at the farmer’s market during the summer and they had a ton of really good looking broccoli this past weekend. Farmer’s market broccoli grown just a few miles away? Or Chinese broccoli from the grocery store grown all the way across the country? It wasn’t much of a debate. What does appear in this book is the steamed buns. Have you ever made them from scratch? Like any kind of piecey food, they’re a lot of work–the filling, the dough (which is a yeast dough) and then putting them all together. Plus keeping them from exploding when you cook them. Honestly, it’s too much for me most of the time, but luckily Trader Joe’s makes a pretty darn good frozen version. That’s what you see here. 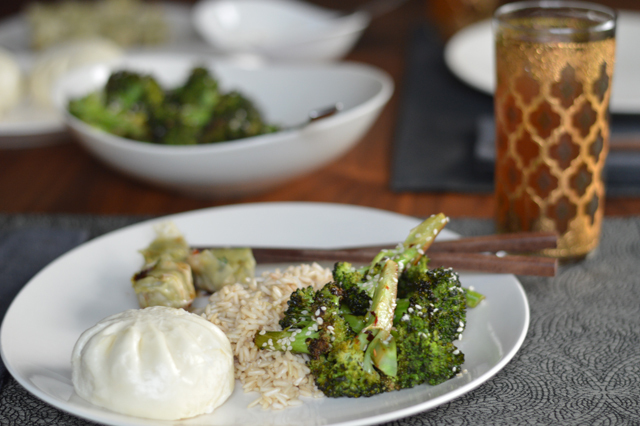 Add a bit of brown rice, the roasted broccoli and there’s dinner in 25 minutes. 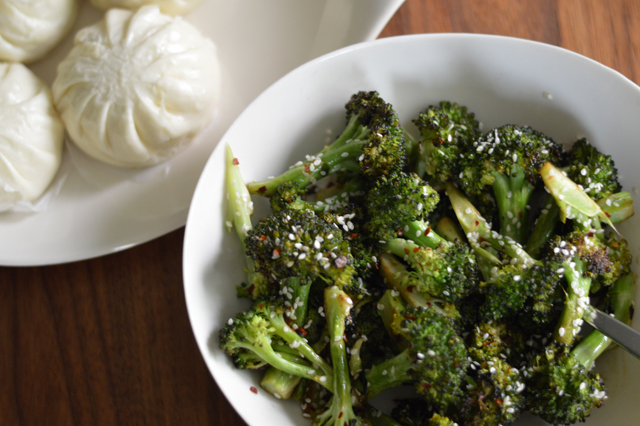 An easy, tasty way to perk up basic broccoli. Cover a cookie sheet with aluminum foil and set aside. 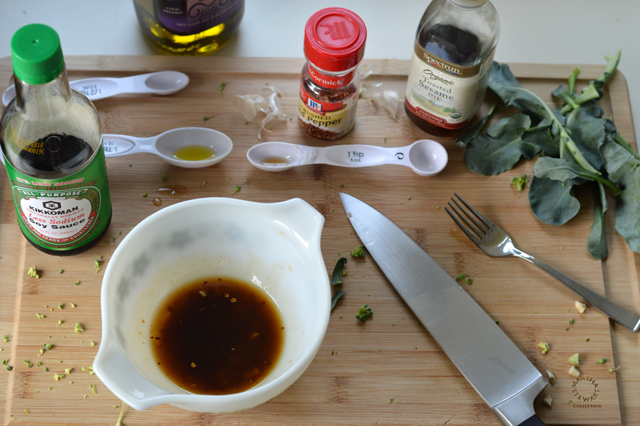 Combine all the ingredients except the broccoli in a small bowl and whisk. 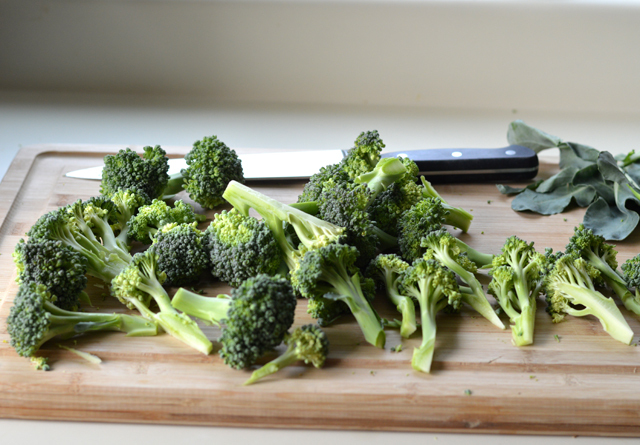 Put the broccoli on the cookie sheet and pour the mixture over, tossing to be sure the broccoli is all coated. Roast for 15-20 minutes or until the broccoli starts to char just at the edges. If you’re not a fan of anything spicy, you can leave out the pepper flakes. It will still be delicious! Disclosure: I’ve met and made cake with Jeannie Lin. I received a complimentary copy of Gunpowder Alchemy from the publisher for review purposes via NetGalley. I love broccoli and am always looking for new recipes. This sounds delicious!